Cardinal Princesses we invite you out to PC for the night. Bring the "Father Figure" in your life, dressed in your very best, ready to twirl and whirl. Remind your date to bring cash so they can treat you to some'sweets before you leave. All proceeds benefit our PTO so be sure to take many chances at the raffle baskets table! Ticket sales are February 11-21. Tickets go home on the 21st for those students who signed up. 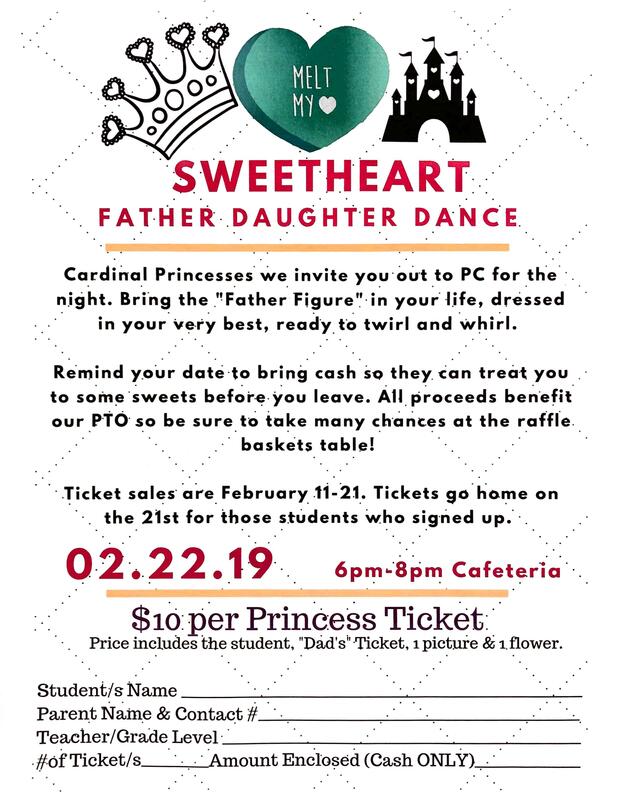 $10 per Princess Ticket: Price includes the student, "Dad's" Ticket, 1 picture & 1 flower. Cardinal Gents we invite you out to PC for the night. Bring the "Mother Figure" in your life, dressed in your very best and ready to strut your stuff on the dance floor! This is your time to shine and be the Kings we know you to be! Come with cash so you can lavish your dat with snacks! Proceeds benefit our PTO. Ticket sales are January 14-23. Tickets go home on the 24th for those students who signed up. Click here to watch our daily morning announcements! You are invited to a Parent Event! This year's Halloween celebration will be on Saturday, October 13th from 6-10 PM at Patrick Copeland Elementary. Volunteering for events or in the school? Background checks are required! Please pick up your background check form in the Main Office at Patrick Copeland, complete it, and turn it in the the School Board Office. Even if you are not planning on going to your child's next trip, please submit your form if you plan on attending any future trips!